Rata-grab is an online food delivery platform which enables hungry professionals to easily order food from local restaurants. We also help restaurants increase their profit margins and increasing their customer reach. What is the customer problem the product is solving: We want to improve the effectiveness of the working man and woman in our economy by limiting the amont of time used in getting food during lunch hours and also to deliver healthy food to our customers. We also want to grow the food sector in our community by providing restaurants the necessary technical and logistics tools for them to scale and be able to compete in the market. Size of the potential market of customers: More than 7 million target customers in Cameroon. List of current or potential customers: We currently have more than 100 unique restaurants partnering with us and are ready to go public with the new version of our platform. What is your solution: We have built an online platform that enables busy but hungry individuals to order their food directly from their mobile devices and laptops. Not only this, we also make sure the food is delivered just in time. 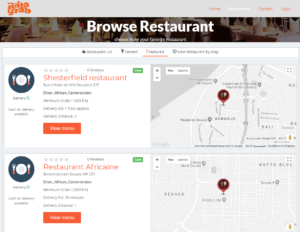 In Cameroon, restaurants and other food outlets provide solutions from : Allowing customers to pre-order their food before it can be delivered to them, Placing orders via phone call and having to to pick it up themselves. Customers prefer to eat in their homes because they can pay as much as 70% cost the food for delivery charges. What is your Business Model: Our revenue model is structured into three. We offer potential partner restaurants Commissions based payments on orders. Restaurants pay a 20% commission per transaction which is paid at the end of every transaction. Subscription based payments. Restaurant pay a monthly fee of $19.8 monthly which is independent on the number of transactions processed. This model is subject to modifications in the later stages of our partnership with restaurants. Premium advertising for restaurants. Restaurants who want to rank top on or search results or what to appear on every search for a particular city pay $5 fee monthly. Describe your competitive advantage and barriers to entry: Otlob and Orderin are among our main competitors. We provide an online platform allowing hungry individuals order food directly on their mobile devices. 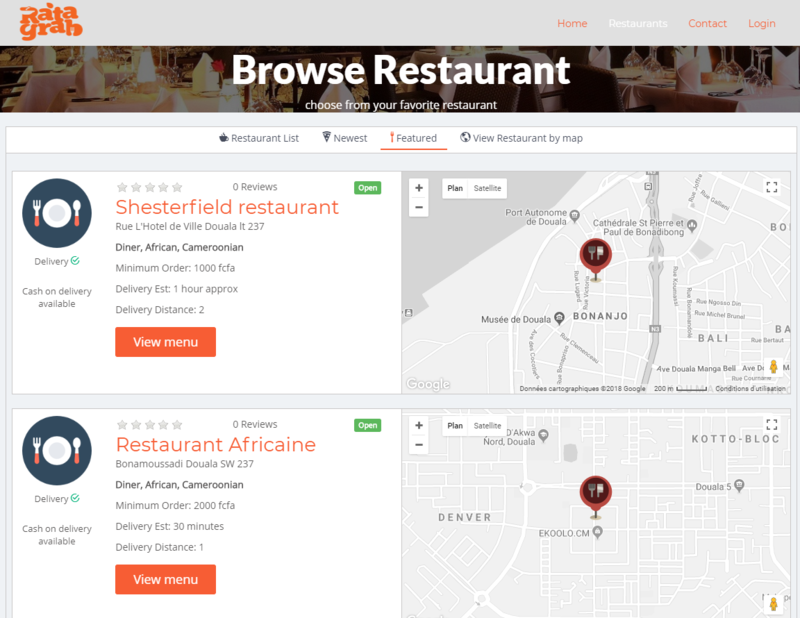 We also provide on demand delivery for takeout ordered using map APIs. We sign long term partnership agreements with our partner restaurants. We do not outsource our delivery to a third party ie we operate our own logistics mechanisms using google's geolocation API. We also provide backend access for restaurants to monitor order history for their menu. When do you reach the Breakeven point: At this current state, Rata-grab will breakeven when we reach 243 orders monthly. I am Njaiyo Sakwe, 23 year old from the SouthWest Region of Cameroon. I am Software developer with 5 year experience. I am a graduate from the Aptech Institute of Technology Bangalore,India. I am founder at Ratagrab, co-founder/CTO Maibeta.com and also worked as software developer for Kerawa.com, Njorku.com, efarm.cm. As a student in Bangalore India, fast food was the easiest thing to order online due to the presence of services like Foodpanda, Swiggy, Zomato and others. Back in Cameroon as a young software developer, I had to walk under the sun to get food and sometimes I wouldn’t find my prefered dish (Eru). Finding the best restaurant was difficult not to talk of finding a restaurant that will deliver food to my office or room. This being the case daily and a common problem, I decided to use the skills ( Software engineering ) I acquired to think of how I could provide a lasting solution and at the same time earn a living. My excitement comes from the fact that I am building a product that will be used by individuals to improve their lived in a way that satisfies them. Above all I see Rata-grab as a product that gives time to professionals who have money to spend but have limited time to spend it. If you are convinced, do not hesitate to become a LION, by investing and purchasing coupons (1 coupon = 28 000 FCFA for 0.02% equity) of the company RATAGRAB. Contact us at contact@zesaa.com and we will arrange an appointment between the promoter, NJAIYO SAKWE, a notary and you.